My car was packed and loaded with teenagers, suitcases, snacks, and one mom who was so beyond ready to get out of town and head to a cabin in the woods for a few days. We were making good time with the cruise control set on 65 and gorgeous scenery rolling by outside of the windows. In just a few short hours we would be at the cabin where there would be no work, no agenda, no schedule. Just days filled with fun. Then we turned down Peter Cave Road. Y’all, never in my life have I experience a road like this one, and I grew up in the country. I’ve seen my fair share of treacherous dirt roads, but none of them had prepared me for this. 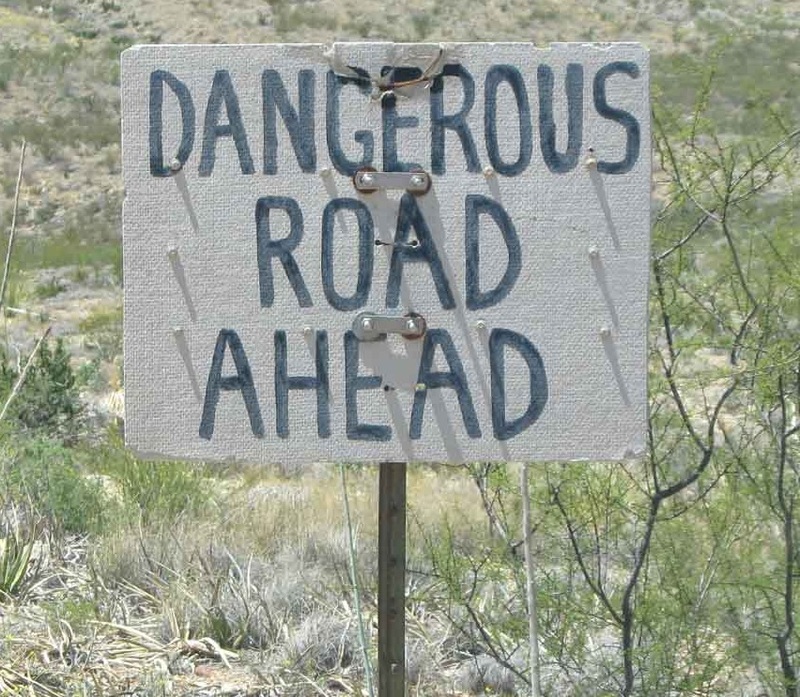 I should have known we were in for a ride when I saw the sign on the side of the road “dangerous road ahead, 4 wheel drive recommended”. I hesitated when I saw the sign, but my GPS told me to turn left, so I did. I had no idea what we were getting into. Five miles. Five miles of dirt road stood between us and the cabin. I know dirt roads well enough to know that five miles might take about 20 minutes, but not this dirt road. This road and these five miles took us over an hour. Several times we came to a complete stop before proceeding. Once we had to get out and move a tree limb out of our way. Every muscle in my body was tense as we headed uphill and then downhill with hairpin turns, steep drop offs, and pot holes like you’ve never seen before. My daughter was holding my phone and counting down the tenths of a mile as we climbed our way up the mountain. Every tenth of a mile was celebrated as if we’d traveled a hundred miles. I began to wonder if we would ever make it. Over an hour later we did. When we pulled into the drive way and saw the cabin the car erupted in celebration. I’ve never wanted to kiss the ground before, but I did in that moment. We had done it, we survived. The next morning I woke up early and quietly left the cabin to go sit on the porch and watch the sun rise over the Buffalo River. I kept thinking about that car ride and our harrowing adventure. The worst part was; we didn’t have to spend an hour of our lives on Peter Cave Road. My GPS chose for us to go down a road we didn’t have to. If we had only traveled a few miles further down the highway there was another road that would have brought us to the cabin without all the drama. I learned a few things driving up Peter Cave Road that I think might be important to remember when life leads us down a dangerous road. Time and distance is relative. We started our road trip on Interstate 49 and ended it on Peter Cave Road. Our trip started with the cruise control set and us covering about 65 miles an hour. It ended with me riding the brake and us going 2-5 miles per hour. A mile is a mile, but road conditions very much affect how long that mile takes to travel. The harder the road, the longer it takes. Slow going is still going. Even when it feels like you’re getting nowhere, you are. Don’t abandon ship. Multiple times during our adventure on Peter Cave road someone would pipe up with “It would be faster to get out and walk.” It sure felt like that was true. As tempting as it was to abandon ship and head out on our own I knew that as slow as the car was it was still a better option to stay in it. I know my own strength; I can’t walk 5 miles carrying all of our luggage up Peter Cave Road. Well, maybe I could, but I promise I wouldn’t have arrived at the cabin before dark, and being in those woods after dark doesn’t sound like much fun. As slow as the car was, it was our only hope. Colossians 3 says we are hiding with Christ in God. When the road is hard, stay hidden in God. Yes, it’s tempting to throw in the towel and go it alone, but we won’t get very far on our own strength. Eyes forward. Peter Cave Road isn’t a smooth road. Bumpy would be a drastic understatement. 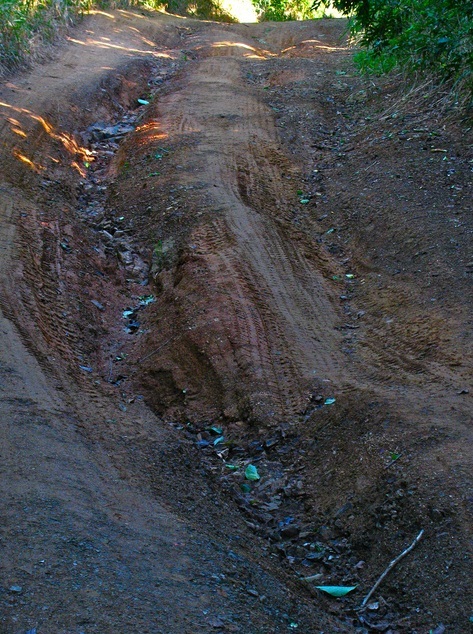 Then there were the pot holes, washed out culverts, muddy holes, tree limbs, big rocks, and many other obstacles. Off the road there was beauty. Lush trees, mountain views, wildflowers, pretty birds, but I didn’t see any of it. I simply couldn’t pay attention to the things around me because I was so focused on the things in front of me. In life, when we are in a season of traveling a hard road it often comes with guilt. We want to focus on other stuff, we want to talk about other stuff, we want to see the beauty, but sometimes we just can’t. Sometimes all we can do is keep our eyes forward. That’s okay. The best way out is always through. Any chance I can get to quote Robert Frost I’m going to take it, but on Peter Cave Road and in life he’s right. Stuck on the dirt road we kept looking for options; is there another road we can take? Would it be better to turn around and go back the way we came? Is there a quicker, easier route? I wanted to avoid the road, but we couldn’t. We had to keep going (as slow as it was) forward. Sometimes hard roads and the pain they bring can’t be avoided, when we have to travel one the best way out is always through. Adventure comes at the end. On the way home from our time in the woods (using the alternate, safer route) I asked the kids what their favorite parts of the trip was. Every one of them said Peter Cave Road. They went on and on about how awesome our car was to get us up that big hill, and how scary it was when we had to drive through the river (seriously y’all it was an epic adventure) and how narrow it was in that one place where the trees were pressing in on both sides and how dark it was it the woods even though it was the middle of the day and how we made it out alive! It was an adventure. One we will talk about for years to come; the story of Peter Cave Road and how we made it out alive. There is something in us that loves to celebrate stories of survival; our Feast of Purim. The Jewish celebration of the Feast of Purim was a joyous celebration commemorating a time when the Jewish people living in Persia were saved by Queen Ester of extermination. They survived, the lived to tell about it, and they remembered and celebrated God’s deliverance. We need to tell our adventure stories and celebrate God’s faithfulness through the hardest roads. At the beginning of our trip one of the kids was in the backseat singing “Life is a highway…” That’s not true. Life is not a highway. Life is a long road. 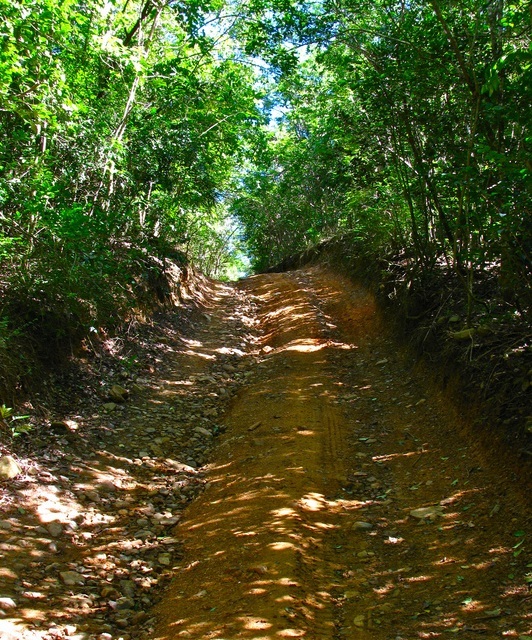 Yes, parts of it are smooth and straight and sunny and fun, but other parts are bumpy and uphill and dark and dangerous. Whatever road God asks us to travel one thing remains the same; He can be trusted to get us to our destination.